Well it's all happening out there, and during the last few weeks, between the showers, I've had a few close encounters with some of the recently arrived migrant birds, and here they are. 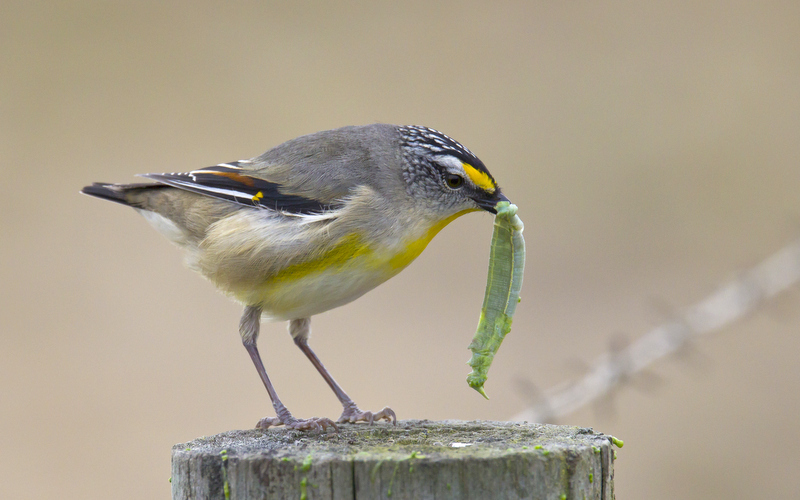 The most widespread species is the Striated Pardalote (at left). At almost every local venue I've visited, the first sound that has greeted me, has been the persistent "pick it up" call of this pardalote. Considering how many there are about and that they all seem to suddenly appear, I can't recall ever seeing a flock or any gathering of more than half a dozen or so birds. 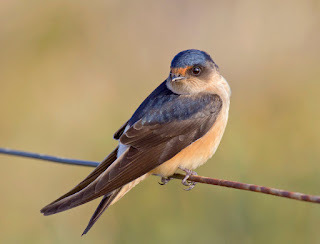 I do recall watching around 20, all gathered in the outer branches of a dead tree in late summer. It had just started to rain after a long dry spell, and they appeared to be 'enjoying' a shower, at least that was my interpretation. The bird pictured had flown, with difficulty, to the top of the post to administer the 'coup de grace' to this caterpillar by bashing the hell out of it. It's certainly a sizable mouthful. 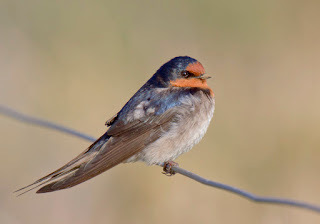 For many people around the World, the arrival of swallows of one species or another, is considered to be the first sign of spring. Although in Tasmania the vast majority of Welcome Swallows migrate to warmer climes during the colder months, a few pairs hang on and manage to survive, often roosting in buildings. The Welcome Swallow at left had obviously started nest building as the bill is covered in dry mud. They gather mud from pools or other water bodies, and use this to form their nests. Often mistaken for swallows are the Tree Martins, particularly in flight. They both hawk for insects in a similar manner, and are often seen together. The white rump and the much shorter tail are the most obvious differences. The Tree Martin at left, was using an old fence line to rest between forays over the nearby heath. It was still cool and there wasn't much flying insect activity, giving a photo opp.. Frequently nesting in holes in large trees, and seldom needing to come down to ground level, they aren't the easiest to come to grips with. 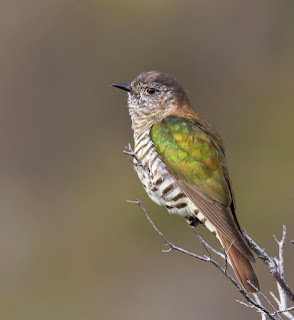 This year, the Shining Bronze-Cuckoos seem to have arrived particularly early, although a few had obviously overwintered, as I outlined in a previous story. I photographed this one (at right) a few days ago at Pipeclay Lagoon, but I've heard them calling from most local birding spots. Perhaps a little more surprising, was recording my first Pallid Cuckoo in the first few days of September, many more will arrive shortly. 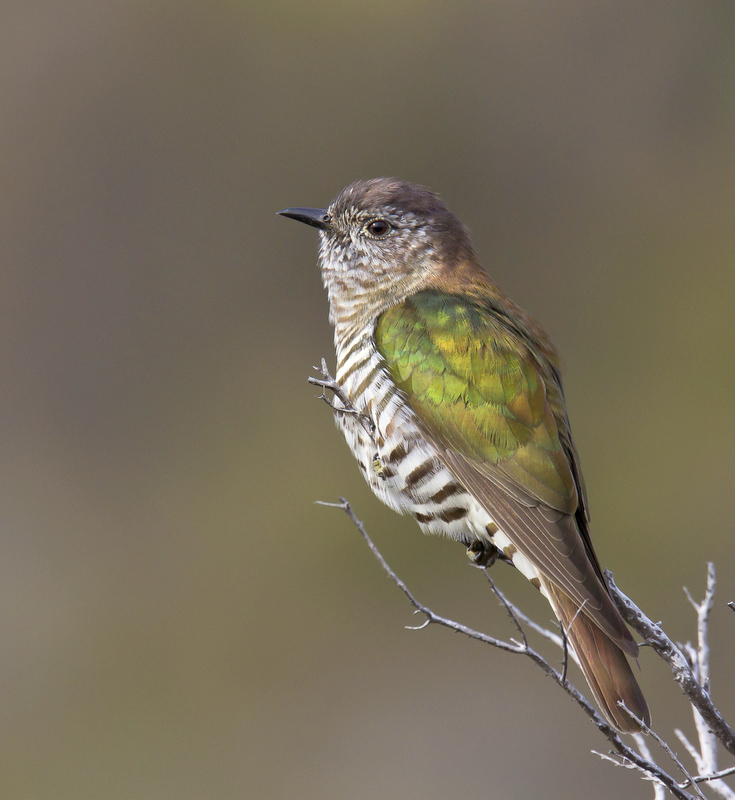 The bronze-cuckoos are small, swift flying birds that are more often heard than seen. From experience, they often call from among the outer foliage of shrubs and trees, and their excellent camouflage makes them difficult to locate. I had the good fortune to find this one while I was photographing pardalotes feeding in low heath. It flew around, occasionally propping in the top of low sun bleached shrubs,and calling. Eventually, and from my perspective, fortuitously, close enough to photograph.